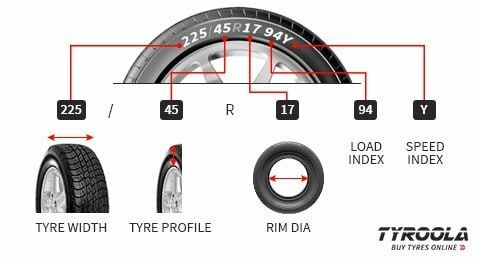 (225) TYRE WIDTH:The first three-digit number is the width of the tyre from sidewall to sidewall measured in millimeters. For example in a size 225/45 R17 tyre, the width is 225 millimeters. (45) TYRE PROFILE:Also known as aspect ratio, is the ratio of the tyre sidewall to the width of the ground-facing wall. It is the two-digit number after the slash in a tyre size. For instance, in a tyre sized 225/45 R17, the 45 means that the height is equal to 45% of the width of the tyre. Thus, the higher the aspect ratio, the bigger will be the sidewall of the tyre. (R17) RIM DIAMETER:The last two digits stand for the size of the rim measured from one end to the other. It tells us the size of the wheel onto which the tyre can be mounted. For example, a 225/45 R17 tyre fits a rim with a 17 inch diameter.